Coin Invest Trust has created a new coin incorporating the rare material Moldavite to celebrate the 10th anniversary of its meteorite coins. About 15 million years ago, a meteorite hit the Danube area resulting in the formation of a natural glass known as Moldavite. Scientists have reconstructed that the meteorite had an approximate diameter of 1,500 meters and approached the earth at the speed of 70,000 kilometers per hour, twice the speed of a modern rocket. The meteorite hit at full tilt, releasing energy exceeding all means of modern technology. The red hot meterorite pushed aside or liquified soil and rocks upon impact. Under pressure, the molten rock formed small drops of Moldavite. The natural glass with the green coloring derives its name from the area with the highest concentration near the Czech Moldova River. Still, Moldavite has been discovered in other locations as well. It occurs within a radius of 450 km from the meteor impact crater in the Nördlinger Ries, located at the border of Bavaria and Baden-Wuerttemberg. The reverse design of the coin uses deep relief and colored digital printing to render a vivid image of the force, heat, and pressure of the meteorite impact from a bird’s eye perspective. 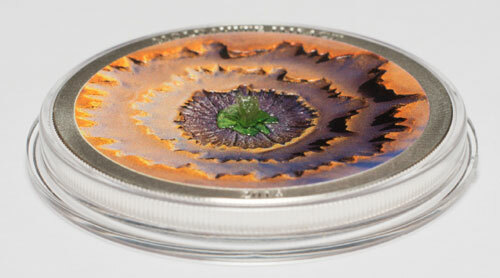 In the center of the coin is the result of the metorite impact in the form of a Moldavite fragment. The inscriptions include “Moldavite Impact” and the “2014” date. The obverse design of the coin includes a portrait of Queen Elizabeth II as the official head of state of the Cook Islands. The inscriptions include “Elizabeth II”, the name of the issuing authority “Cook Islands”, and the nominal value “5 Dollars”. Each coin is struck in .999 silver to proof quality with a weight of 1 ounce and diameter of 38.61 mm. The mintage is 2,500 pieces. The coins are minted by B.H. Mayer’s Kunstprägeanstalt GmbH. Collectors can purchase the issue through specialty dealers. Where do they sell Moldavite Meteorite silver commemorative coins as well as other meteorite insulted silver coins?